Tax breaks have boosted innovation and fuelled overseas investment, but industry insiders fear that threatened budget cuts could slow growth. A run of high-profile international sales and licensing deals has attracted considerable interest from multinational pharmaceutical companies looking to invest in biotechnology. And although the medical sector garners the most headlines and funding, Australian agricultural, environmental and industrial biotechnologies are making their debut on the world stage. But despite the enthusiasm, there are concerns that Australian biotechnology faces a major threat from the federal government’s planned overhaul of a tax-incentive scheme that many argue has delivered the industry’s biggest boost. Scientific-research funding has been severely cut in recent years — falling to just below 0.6% of gross domestic product in 2014–15. But biotechnology has received a lot of cash from the government. First, there was the Medical Research Future Fund, announced in May 2014; this was an Aus$20-billion federal-government fund (worth about US$18 billion at the time) to support medical research and innovation. Then, in 2016, came the Biomedical Translation Fund, an $500-million scheme jointly supported by federal government and private coffers to “translate good science and research effort into real-life healthcare solutions”. And the Research and Development (R&D) Tax Incentive has been providing refundable tax offsets since July 2011. Glenn Cross, chief executive of AusBiotech in Melbourne — the sector’s industry body — says that not only is the top end of the biotechnology sector looking extremely healthy (see ‘Deal makers’), but there’s plenty more activity further down. “At the other end of the market, we’re continuing to see new technologies commercialized and investment coming into the sector,” Cross says. As well as a steady stream of biotechnology companies listing on the Australian stock exchange, Cross says, the R&D Tax Incentive scheme is encouraging international companies to see Australia as a destination for research and development. Companies with a turnover of less than $20 million a year may be able to get 43.5% of their annual R&D spend refunded in cash; companies with higher turnovers could be eligible for a 38.5% tax offset. In 2013–14, there were nearly 12,000 registrations for the incentive scheme. Overall, the federal government refunded around $2.95 billion for an R&D spend by those companies of $19.5 billion. But two reports have questioned the scheme’s effectiveness in boosting research and development. The first, presented to Australia’s prime minister, Malcolm Turnbull, in April 2016, concluded that the growth of the tax incentive was jeopardizing the scheme’s long-term sustainability (see go.nature.com/2rj9z1s); it proposed capping a company’s annual refund at $2 million, to keep costs down. Its authors argued that this was unlikely to harm small and medium-sized enterprises, which were already gaining a premium refund because of their lower turnover, nor would it significantly affect larger companies, which had greater access to alternative sources of funding. The second report, published last November, recommended an annual cap of $4 million per company, with a maximum cumulative refund of $40 million per company (see go.nature.com/2rjfgyh). The report, produced by Innovation and Science Australia, an independent advisory board, also suggested that the tax incentive should kick in only once a company’s R&D spending exceeds 1% of its total annual expenditure. The biotechnology sector is unenthusiastic about the capping proposals. “The biggest concern we have is that they would make changes to the R&D Tax Incentive that would stop investment coming in internationally,” says Cross. They could also result in less research and fewer clinical trials being conducted in Australia. International interest and investment is vital for the growth of Australian biotechnology. Sue MacLeman, managing director and chief executive of MTPConnect in Melbourne — a not-for-profit, government-funded organization to support the medical-technology and pharmaceutical sectors — says that, because the sector is relatively small on a global scale, Australia is unlikely to develop its own big multinational pharmaceutical or biotechnology companies. Rather, it will fit into the bigger picture, she thinks, as a market of high-quality biotech start-ups for international buyers. Australia’s biotechnology sector boasts a series of record-breaking deals in recent years. May 2014: Irish pharma group Shire buys Fibrotech and its innovative fibrosis therapeutic candidates for Aus$615.1 million (US$557.5 million). June 2015: Novartis buys Spinifex Pharmaceuticals for an estimated $1 billion — the biggest Australian biotechnology deal up to that time. September 2015: Dr Reddy’s, founded in India in 1984, acquires Hatchtech and its head-lice treatments for $279 million. Nanotech drug-delivery company Starpharma signs a licensing deal with AstraZeneca worth more than $650 million. August 2016: Protagonist Therapeutics, a University of Queensland spin-off, raises $118 million in Nasdaq listing. November 2016: SUDA, a company that specializes in oro-mucosal drug delivery, signs deal worth up to $34 million with Chinese pharmaceutical company Eddingpharm for an insomnia therapy. July 2017: The Walter and Eliza Hall Institute in Melbourne sells a royalty stake in its anti-cancer treatment venetoclax to a subsidiary of the Canada Pension Plan Investment Board for up to $424 million. “We’re seeing an increase in the number of scouts on the ground from those pharma companies, clearly looking for these sorts of [biotechnology] science,” MacLeman says. She adds that Australian biotechology companies are increasingly offering technology that has already made it to phase I or phase II clinical trials. This makes a start-up or spin-off much more attractive to international pharmaceutical companies — and that means a bigger return on investment for the Australian company once it is bought, MacLeman says. Australian medical biotechnology is probably most famous for a cervical-cancer vaccine developed by Ian Frazer and Jian Zhou at the University of Queensland in the 1990s, but the sector is now making waves internationally in a wide variety of fields. “We’re very competitive in oncology, infectious diseases, things like vaccines, respiratory, neurology, ophthalmology [and] we see good progress in regenerative medicine,” MacLeman says, adding that Australia’s clinical-trial capability is part of its biotechnology success story. A collaborative network of clinical-trial units extends across the country, and states such as Victoria are courting international pharmaceutical companies, urging them to bring their early-stage trials to Australia. “The fact that we’re being asked to do those initial clinical trials here in Australia means that we have the frameworks in place. We have the skill and expertise in place to actually look at some of these technologies,” says MacLeman. MacLeman says that approval for clinical trials through the Australian Clinical Trial Notification scheme can take as little as six weeks, compared with about a year for an application submitted in the United States under the Investigational New Drug programme. But things are less streamlined for drugs from biological sources, says Melissa Little, programme leader of Stem Cells Australia — a national network of stem-cell researchers and institutions. Little, based in Melbourne, says that “for a clinical trial where you’ve got to do cellular production, even for a phase 1, it’s easier to go offsite”. That’s because the Therapeutic Goods Administration, Australia’s regulatory body for therapeutic products, is “much smaller and much less experienced with biologics” than is the US Food and Drug Administration. The TGA also has a loophole in its regulation that allows a registered clinician to administer a stem-cell treatment using a patient’s own cells — even if that treatment is unproven — without going through any regulatory checks. Organizations such as Stem Cells Australia are lobbying hard to have the issue dealt with, and Little says that the TGA is looking at how to do this. The regulator is well respected at home and abroad, but it has been criticized for taking too long to approve medicines and medical devices, compared with its overseas counterparts — a concern that was highlighted in a 2015 review commissioned by the government. Since then, the TGA has set up a programme called SME Assist, to help small and mediumsized enterprises navigate more easily through the registration process. Although 69% of Australian biotechnology takes place in the health and biomedical arena, the country is also emerging as a global player in agricultural, environmental and industrial biotechnology. Michael Christie, a patent attorney in Sydney who chairs the New South Wales division of the Ag Institute Australia — the industry body for agricultural and natural-resource management professionals — says that the country is particularly strong on basic and applied research in agricultural biotechnology. But he adds that the take-up is more patchy. 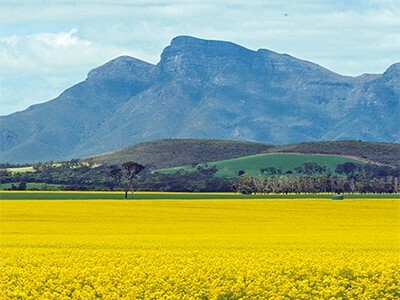 For one thing, South Australia, Tasmania and the Australian Capital Territory all have moratoriums on the commercial cultivation of genetically modified crops. Christie says that the regulatory framework for genetically modified crops is also a barrier to adoption. “Generally speaking, the scheme is quite complicated and the procedures for obtaining regulatory approval are unduly cumbersome,” he says. But he also stresses that the framework helps to maintain Australia’s reputation as a “clean and green” source of agricultural products. Although it has not received the same funding and investment as medical biotechnology, Christie says that agricultural biotechnology is becoming more of a topic of conversation among investors. Much of the research in the field is done within the Commonwealth Scientific and Industrial Research Organisation (CSIRO), Australia’s national science agency. But in recent years, the formation of primary industry-focused research and development corporations, such as AgriFutures Australia, has widened the field. “These groups have placed a stronger emphasis on commercial outcomes, so we’re seeing more applied-research programs as well as collaborations being formed between publicly funded research organizations and industry,” Christie says. CSIRO is also a hotbed of environmental and industrial biotechnology — particularly in relation to mining, an area in which Australia is a key global player — says Anna Kaksonen, who leads the biotechnology and synthetic-biology group at CSIRO in Perth. Mining biotechnology uses microbes “to extract metals from low-grade ores and also metal-containing waste material such as e-waste, battery waste, mining waste,” Kaksonen explains. It is also being used to clean up polluted sites, such as old mines. “There are a lot of legacy sites in Australia, so there is a lot of work in that space where microbes could be used to remove sulfate metals and acidity from the water,” she says. Many of the microbes used in this work are found in nature, but researchers are looking at ways of engineering them to better withstand the their contaminated environments. Australia has no shortage of ideas in biotechnology, but it is struggling to find people with relevant commercial experience, says Cross, particularly at the most senior leadership levels. To address this, the Australian government announced in March this year a pilot of a new version of the entrepreneur visa. Unlike the current visa, this one does not require entrepreneurs to have capital backing. Ministers also launched a Global Talent Scheme, offering four-year Temporary Skill Shortage visas to science, engineering or medicine start-ups, as well as to established businesses seeking people for positions with salaries above $180,000. The relatively small size of Australia’s private biotechnology sector — the national Stock Exchange lists 140 life-sciences companies — can also make it difficult for graduates to find work outside academia and research institutions. Andrew Webb, acting division head for systems biology and personalized medicine at the Walter and Eliza Hall Institute of Medical Research in Melbourne, says that even positions in academic research are “few and far between” in Australia. Australia’s commercial biotechnology sector is growing fast, however, and hotspots such as Melbourne — which hosts 27 leading biotechnology-research institutes — are gaining ground internationally. In terms of supporting and nurturing biotechnology start‑ups and spin‑offs, Webb says that Melbourne is approaching the standard of Boston, San Francisco and Cambridge, Massachusetts. 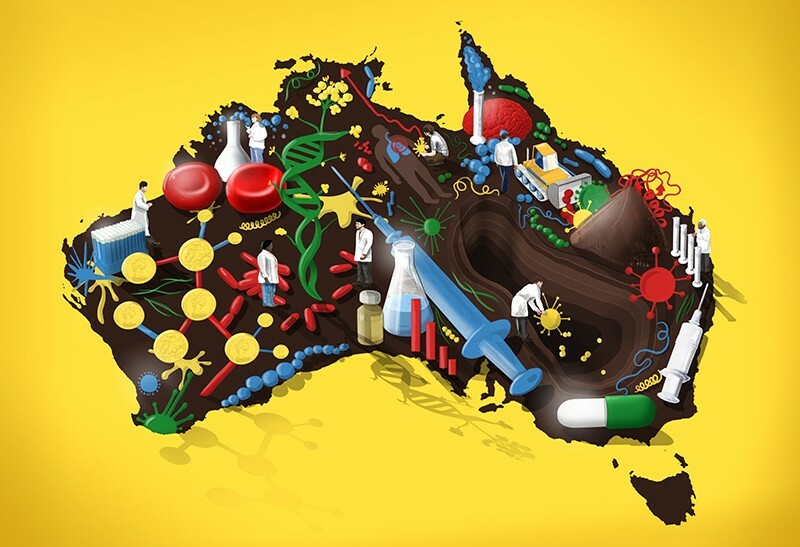 This article is part of Nature Spotlight: Australia’s biotechnology sector, an editorially independent supplement produced with the financial support of third parties. About this content.